9005 ft (2745 m) Highest point in Australian territory . Heard Island is a volcanic island in the southern Indian Ocean, with an area of about 160 square miles (400 sq km) and topped by the magnificent stratovolcano of Big Ben. 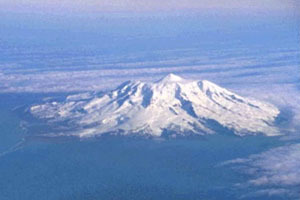 About 85-90% of the island is covered by glaciers and permanent snow despite its relatively modest latitude of 53° S, a testament to the continual foul weather and heavy precipitation of the Southern Oceans. Heard Island was a major base for elephant seal hunting during the late 1800's, and an Australian research station was built at Atlas Cove on the northwest part of the island in 1947. This station was abandoned in 1955 and the island has been mostly uninhabited since that time, except for occasional scientific parties which have stayed for as long as a year. The volcano itself is extremely active, with a historical record of eruptions reaching back to the late 1800's. 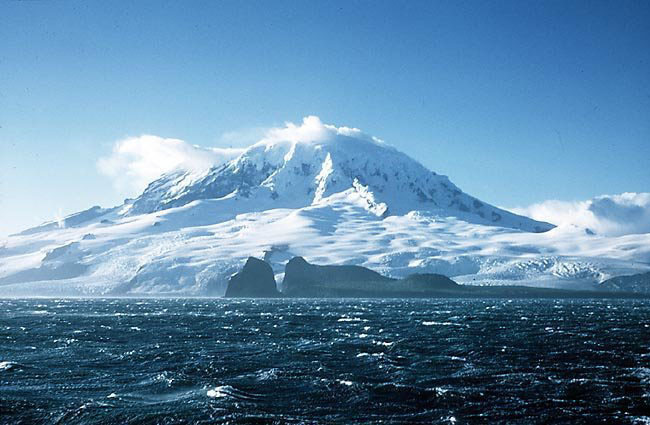 The main cone is topped by a broad plateau about 3 miles (5 km) across at about 7500 ft (2300 m), which is an eroded ice-filled caldera breached to the southwest, and the newer summit cone of Mawson Peak rises above this in the western part. A crater about 150 ft (50 m) in diameter is located atop Mawson Peak, and this was observed to have an active lava lake within it in 1986. 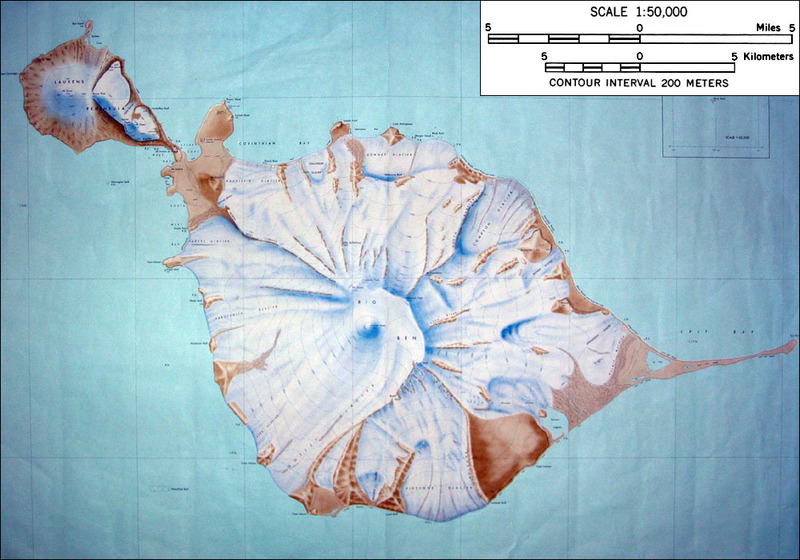 Ski ascents and descents of Big Ben should be possible starting from beachheads on the northwest or eastern parts of the island. The satellite cones on the Laurens Peninsula at the northwest tip of Heard Island, Mount Olsen, Anzac Peak, and Mount Dixon, reaching about 2300 ft (700 m), might also be skiable. Permission is required from the Australian Antarctic Division in order to land on Heard Island, and visitation is limited to 400 people annually (although far less currently go there).